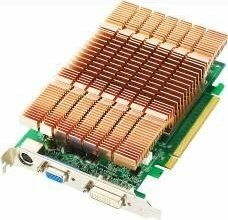 July-2008, Taipei Taiwan – BIOSTAR Microtech Int’l Corp., the VGA card specialist, announced today mainstream performance solutions –Sigma Gate V9503GT21& V9502GT51. Both cards are based on NVIDIA GeForce 9500GT GPU, which is manufactured using 65nm technology and supports NVIDIA Unifiied Architecture. This architecture will fully unify shader core, which dynamically allocates processing power to geometry, vertex, physics, or pixel shading operations, delivering up to 2x the gaming performance of prior generation products. With 550 MHz core clock and memory clock of 1,600 MHz, BIOSTAR V9503GT21 offers 32 Stream Processing Units with 256MB GDDR3 Memory, provides the high processing power and sufficient bandwidth via PCI Express 2.0.With the V9503GT21 hardware technical features, immerse gaming with amazing graphics is now within the reach and budget of most PC gamers everywhere. Ultra-realistic smoke, rain, explosions, lighting, terrain deformation and motion blur enable jealousy-inducing, lightning-fast game play in the hottest games, including Crysis, Hellgate: London, Call of Duty 4, and Gears of War. In regards to High Definition imaging enhancement, BIOSTAR V9503GT21 also supports NVIDIA® PureVideo™ HD technology which includes H.264、MPEG-2、WMV、WMV HD for high-definition video decode acceleration and post-processing for better picture clarity and smooth video scaling for movies and video. This feature is not only good for gamers but also ideal for consumers who use the PC with LCD monitor to enjoy the digital movies or video. The other available model based on NVIDIA GeForce 9500GT is V9502GT51.It offers same technical features as well as V9503GT21,moreover, based on DDR2 512MB Memory size and ram clock frequency 1000MHz.The overall presentation of BIOSTAR V9503GT21 and V9502GT51 is indeed beyond pure mainstream but closer to hard-core level of graphics performance. DirectX 10 GPU with full Shader Model 4.0 support delivers unparalleled levels of graphics realism and film-quality effects. Advanced shader processors architected for physics computation enable a new level of physics effects to be simulated and rendered on the GPU—all while freeing the CPU to run the game engine and artificial intelligence (AI). Designed to meet the output protection management (HDCP) and security specifications of the Blu-ray Disc and HD DVD formats, allowing the playback of encrypted movie content on PCs when connected to HDCP-compliant displays. Blazing-fast RAMDACs support dual QXGA displays with ultra-high, ergonomic refresh rates–up to 2048×1536@85Hz.